Developed specifically for the Special Operations community, the Sig Sauer MCX Virtus is a completely modular weapon system built around Sig's proven short stroke gas piston system. 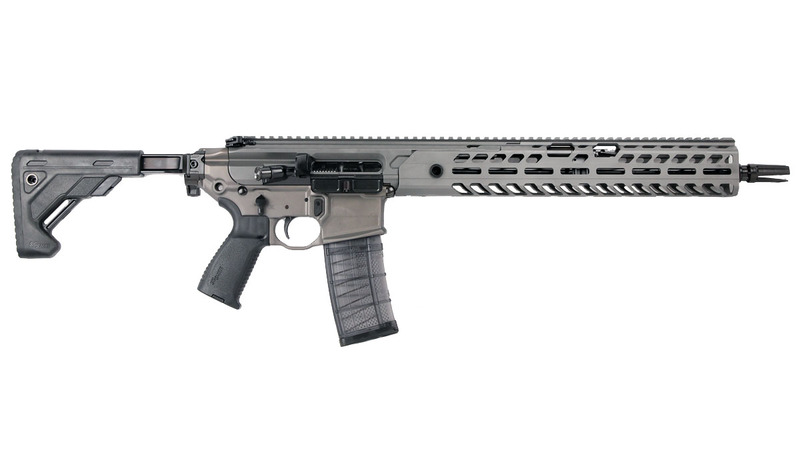 Lightweight, free-floating aluminum M-LOK rail system, quick change barrel capability, ambidextrous AR-style controls, 16" CHF barrel, low-profile folding/telescoping stock, and multi-caliber capability (5.56mm, .300 Blackout) in a package weighing under 8lbs makes this platform a serious competitor for LE and civilian service. Additional Virtus specific features include the Matchlite™ Duo trigger for crisp, clean pull, and stealth gray finish. Comes with one 30RD magazine. TGS is BEST IN CLASS. Their service is awesome, as they are very knowledgeable and don't BS you, if they don't know, they say so and then go and find the answer. S/S Virtus 300BO is a fun weapon and a nice tweener between the .223 and .308. Easy to shoot and comfortable especially with a silencer. Does not replace either the .223 or .308, but fun and does the job. Ammo is ridiculously expensive.